MINI Cooper Acccessories + MINI Cooper Parts :: OutMotoring.com MINI Blog :: MINI Performance Parts :: Yes, silicone hoses are better than stardard rubber hoses. A customer just called and asked about getting replacement factory radiator hoses for his 2003 MINI Cooper S. While we can get any OEM factory part that MINI offers there are often good reasons NOT to buy OEM parts. In the case of interior cabin filters, spark plugs, plug wires, exhausts, suspension components, radiator hoses and a BUNCH of other items it just doesn't make sense to buy OEM parts. As is common with many aftermarket parts, you can upgrade a worn out factory part to a better quality and longer lasting part for the same or less money. With radiator hoses it's a wash in price but at the end of the day the silicone is a better option because it will outlast the lower quality OEM rubber replacement hoses by a longshot. Another thing to consider is that the kit we offer has multiples hoses to replace the most common hoses to fail. Save yourself some time and tons of hassle by just replacing a bunch of the radiator hoses at once. It will save another trip to the shop with the same labor charge as well another round of radiator fluid (which is quite expensive). Select from Red, Blue or Black to match or contrast your MINI! 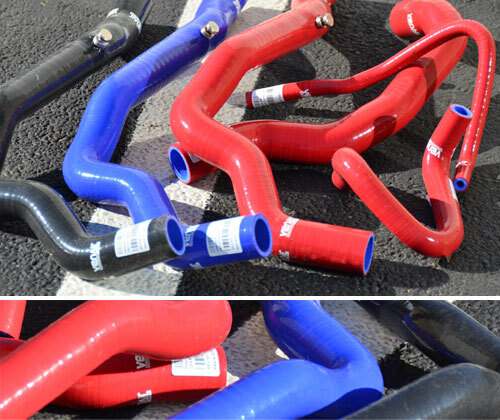 Comments on Yes, silicone hoses are better than stardard rubber hoses.